Since I've had so many requests for how-to instructions on the ornaments, I thought I'd post one set of instructions each day to run in tandem with SCT's annual "12 Days of Holiday Giving." You won't want to miss out on these great give-aways, as they are always so wonderful and generous! Today's ornament is the glass Santa's Belt in the upper, left corner of the crate. It's sparkly, festive and oh-so easy to make! Trim various narrow widths of red patterned papers and cardstock (1/16" to 1/8" wide) and 6" long. I used about 30 strips on this ornament. Wind each strip around a pencil and hold it in place for a few seconds. Because paper has memory, when you slide the strip off the pencil, it will maintain a curly, corkscrew shape. Remove the cap from your ornament and slip each curled strip into the hole, one at a time. Shake the ornament occasionally to mix up the direction the curls are going. When you are happy with the fullness of the ornament, replace the cap. Cut a length of mini red pom pom trim and glue it around the perimeter of the ornament cap. Use a scrap of paper to measure and mark the circumfrence of your ornament. Add 1/4" inch to the measurement and cut a piece of 1/2" black ribbon to that length. Run a piece of two-sided tape across the back of the ribbon. If your tape does not have release paper, place it on a piece of waxed paper temporarily. Cover the front of the black ribbon with a strip of double-sided tape. 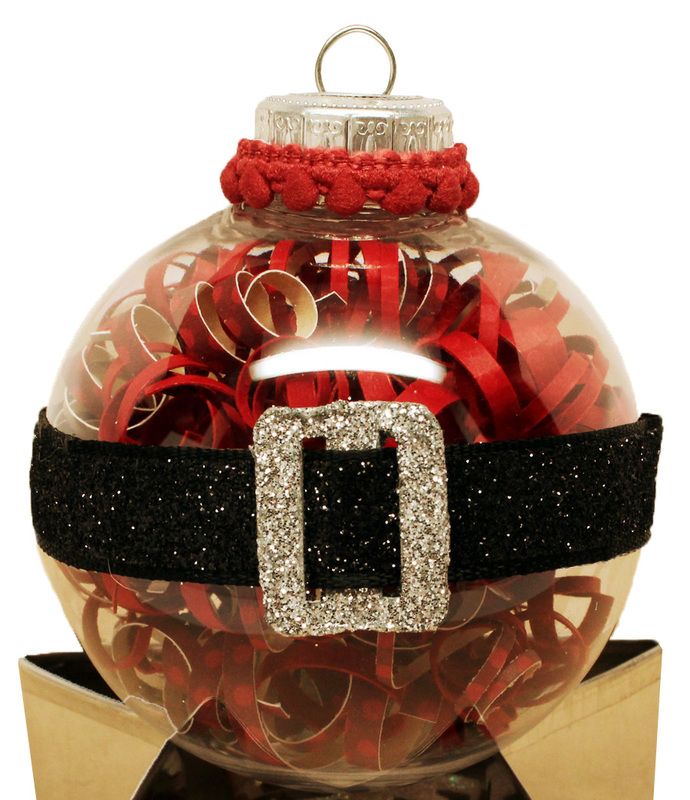 Shake black glitter over the entire surface and rub it into the ribbon in a circular motion. Shake off the excess glitter. From a scrap of chipboard, cut out a ¾"wide by 1" tall rectangle. Cut out two slits, side-by-side, from the center as shown. Run a silver pen (or silver paint) around all of the cut edges. Cover the piece of chipboard with two-sided tape, trimming out the two slits. Shake silver glitter over the entire surface and rub it into the tape in a circular motion. Shake off the excess glitter. Thread the black glitter ribbon through the slits in a under-over-under direction as shown. Remove the release paper from the double-sided tape and apply it to the center of the ornament, overlapping the ends at the back. That's it, your first ornament is done! See you tomorrow with ornament #2! I can't wait to see days 2 - 12! Thanks for sharing this easy project. Oh wow oh wow! I am pinning every single tutorial so I can make the whole thing! Gorgeous!!!!! Thank you so so much for all the hard work you put into making these tutorials for us! Happy Holidays to you, your staff, and your family! Love all the projects! Thanks for the tutorials! You are awesome! Well how fun is that!!! This is adorable! I'm so excited for Day 2! I'm so glad you're sharing instructions for these! They all looked so wonderful in the magazine! It's going to be a very fun 12 days of fabulous ornaments! I love that you're posting instructions. I was just trying to figure it out for myself. Thanks!!! Very cute! Looking forward to the next 11 days! Just darling! Thanks for sharing this. Thank you for sharing! It's so cute! Oh, I was soooo wondering how you made this cute ornament! Thanks so much for sharing the details,....I am rushing out today to get supplies, because my DD and grandkids are gonna love these hanging on their tree!!! Thanks, Becky! love it! thanks sooo much! I love it! Good idea! Thanks for sharing!!! Such a clever gal you are! 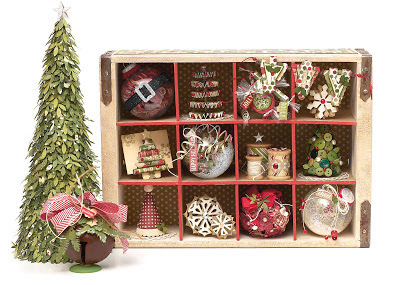 This is such a cute project, love this ornament and plan to do this one with my daughter. I can do that! :-) Fabulous! I am going to have to try this one. Thanks! Your ornament crate is fantastic. Love this Santa inspired ornament! Thanks for the great instructions. The snowflakes ornament is really gorgeous!! I must try them! Thanks for the inspiration! wow, LOVE that crate! so fabulous!! 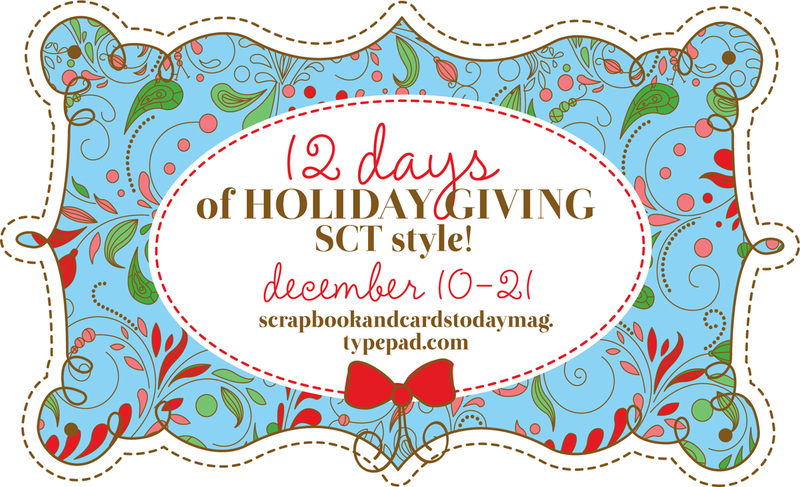 Love the Snowflakes I saw on the SCT page, but I don't see it here? Is my browser missing something? thanks for sharing this well presented project. I am adding this to my bucket list. Perfect for a gift. That is so cute! As all of them have been.